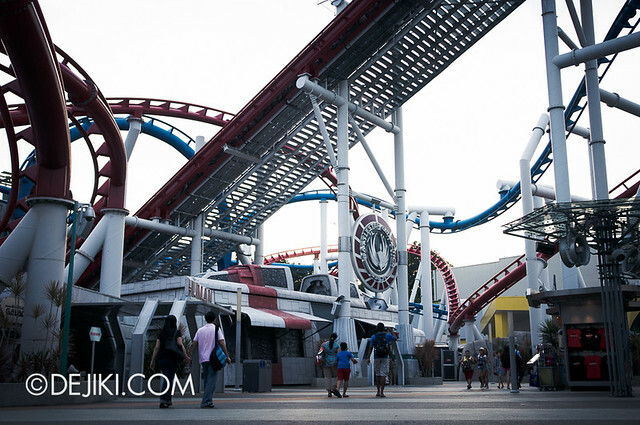 While the extensive coverage of Halloween Horror Nights 3 continues, I have some miscellaneous updates from the park, including rumours about Battlestar Galactica. I’m glad that everyone enjoyed my park coverage so far and I will continue to produce USS Monthly Park Updates as long as the park is able to keep my interest. Right now, that is Halloween Horror Nights. I do apologise if the HHN coverage has been overwhelming for readers who aren’t fans of the event. There are still several entries but everything will be done by early November. I will then resume the Disney Parks series. It has been three months since the mysterious incident at Battlestar Galactica: HUMAN, part of the pair of the world’s tallest dueling roller coasters. Both sides of BSG have been closed since then. 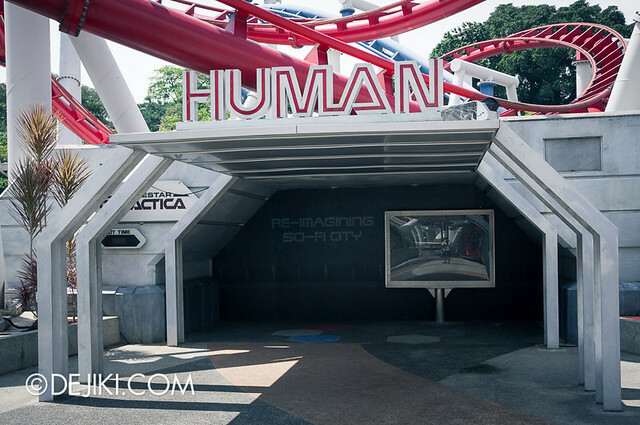 For the past few weeks, people have told me that the park has decided to remove the Battlestar Galactica attraction. The attraction has been dropped in most marketing materials (all references of BSG seem to be removed on the official website too), although this could be a way to cut guest confusion and disappointment. Entrances to both roller coasters have been sealed up, which I hope is a relief to the crew members that were stationed here all day, repeating that same sentence over and over. Re-imagining Sci-Fi City. That, really, could mean… anything. The attraction’s majestic logo, which used to have the “Presented by Panasonic” sponsorship logo below it, has been replaced. It now shows the “Sci-Fi City” icon. 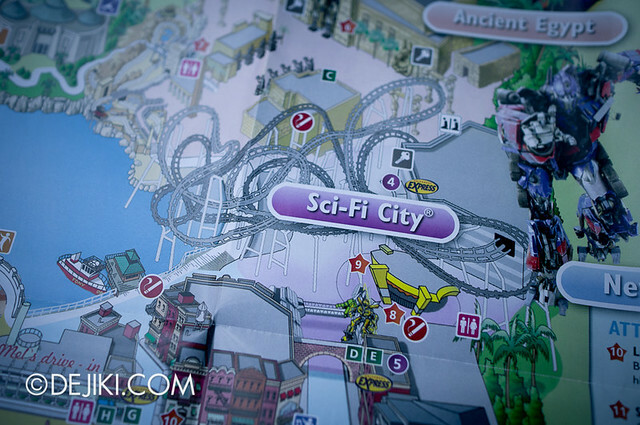 The park map no longer lists BSG on the map and guide, with the graphics representing the roller coasters greyed out. This drops the park’s total number of attractions to 18 (from 20). When asked, park crew members said that the ride will still eventually reopen in the future, with no definite date. Still no statement from the park about the incident or prolonged “attraction review”. While I do hope that the roller coasters will roar at the launch tracks again, the talk around the park is that it’s closed for good. Oh well. Let’s continue waiting for an announcement. According to one tipster, the park intends to leave the tracks as it is – on display – for year or so. Making this decision suggests that the ride’s problem is too complicated to fix, or as old rumours (going way back to 2010) have already warned us: The ride truly requires drastic re-engineering of some track sections and the ride vehicles. Nonetheless, it has been a safe ride when it was open. I survived 150+ rides – on each side. The park will only start dismantling when plans for the replacement attraction have firmed up and ready to go. It will be a major task because Sci-Fi City is at the “front” half of the park. The outdoor section of Sci-Fi City is expected to close for a long time. Please note that this is just a rumour and the park has yet to make any announcements or confirmed anything. It could be false. Marvel’s off limits to Universal now, so I’m not sure what else could fit within Sci-Fi City (without being generic, but they could). While I love drop tower rides, I hope the park does not build a pair of drop towers in place of BSG. In any case, the park needs a well-themed, thrilling attraction. Another way could be to get rid of Sci-Fi completely (only leaving Transformers section on its own, maybe re-theme into a slightly less futuristic New York) and develop a completely new area in place of BSG. Or something that would more effectively bridge this futuristic world to Ancient Egypt. I’m sure most people would want The Wizarding World of Harry Potter in Singapore, but that’s unlikely unless the park is capable of expanding out of the current resort boundaries. 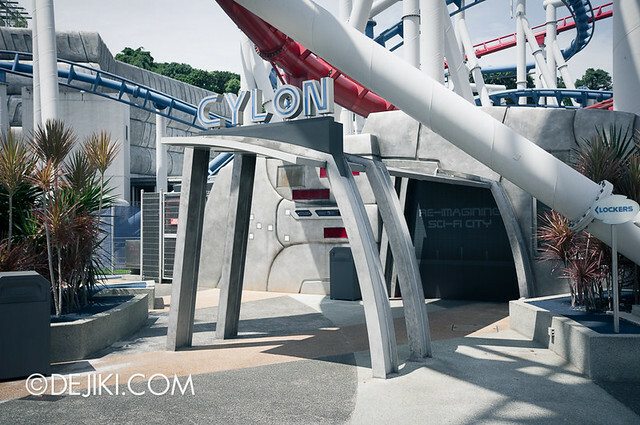 What would you want the park to replace Battlestar Galactica with? Post a comment and discuss! The Halloween Edition of Monster Rock will be performed even during the day until Halloween Horror Nights 3 ends on 3rd November 2013. This Special edition replaces Jekyll with Beetlejuice, and all the other characters received changes in costumes. The stage also has some new props, notably tombstones and a redesigned arch around the stage. Michael Jackson’s classic “Thriller” takes over “You Give Love A Bad Name”, which ends the show with a rather epic finale. In the previous entry, the Daddy O’s show was said to be replaced with The Cruisers. This is incorrect – the Daddy O’s show is still being performed along side The Cruisers. Interestingly, the park has staggered the opening hours of some attractions. These attractions are no longer open at the start of the day (10:00AM). This has been observed on a Friday. More information will be added when available. 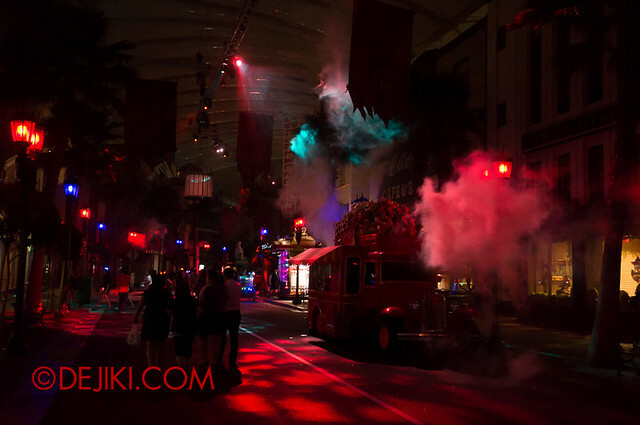 The world’s best and most extensive event coverage of Asia’s Blockbuster Halloween event: Halloween Horror Nights 3 – only at Dejiki.com! I will be so glad if BSG is removed. I liked the ride before but I soon got really bored. I would love to see a new area being developed here. They really have a lot of space to work on if they get rid of Sci Fi City. What attractions would you want to see at the park, Luke? I also like Men in Black. Maybe an updated version. The advantage is that this can fit into Sci-fi city very well. BSG was the only thrilling ride at USS. I know there are people that can not ride these rides but there are 15 other slower rides for them. If they remove BSG they better replace it with something equally or more thrilling or USS will have lost a lot of appeal for thrillseekers. I heard they may open a Star Wars ride in its place. Not sure how true that is. Sad to see the BSG close down. Given that the Star Wars franchise is now owned by Disney, this is unlikely to happen. Another dueling roller coaster would be great, maybe something similar to dragons challenge? If BSG were to be removed it would be a sad day indeed. The dueling heterogenous coaster was to be a world’s first on many fronts: tallest dueling coaster, first launched dueling coasters, tallest dueling coasters etc. 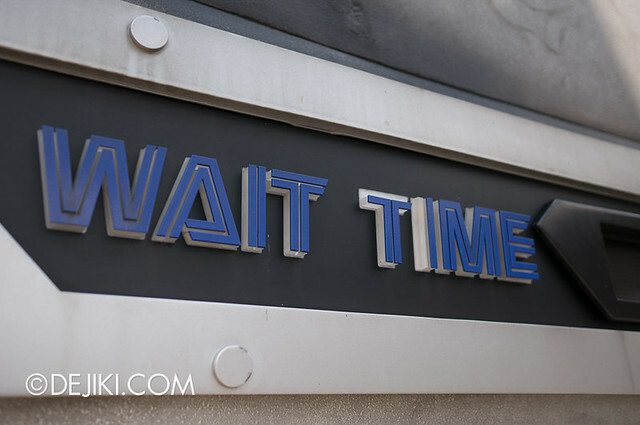 However, other than the technical problems fraught with this ride since opening day, it never really ‘dueled’ very well –> the near misses and collisions were not easily appreciated by guests. This was also meant to be a prototype to be showcased to the world by Vekoma, the ride manufacturer, and to entice other parks to build similar copies. Seems this would be the end all for it if rumours were true. Hopefully if another coaster gets built here it would be a B&M one. Perhaps they can consider a Hollywood Dreams type ride (from USJ) and save the space for something else using the KuKa Arm technology (Forbidden Journey of Harry Potter). Maybe King Kong?? Indeed a pity, especially when we think about launched dueling coasters – this is the only one. While it didn’t duel well (and had all sorts of other issues), it is quite a memorable ride. Ah, so many good memories on this ride, including: riding with some of the crew members (while they are supposed to be working!) late at night, learning some of the “tricks” and of course, hearing all sorts of funny things people scream in the “Pre-March 2012” (vest-free, lap bar-only) version of HUMAN. I met someone who (claimed that he) visited the park 3-4 times a week and went on BSG at least 10-15+ times per visit. I would want to know if his life “ended” when the ride closed. It appears that the “prototype stigma” has stuck on since before BSG opened. There were lots of fanfare when the trains and restraints design were unveiled, but somehow no park has picked up the new (more prominent) features that BSG offered. Personally, I am hoping that this is just a rumour and that the park will reopen the ride eventually – Late 2014 or anything – just fix the root of the problem. In the meantime, they need to address the extended closure properly with a formal announcement. I would love to have The Simpsons Ride in place of BSG roller coasters! It is one of the most wonderful IMAX computer graphic simulation ride I had ever took, and no 3D glasses required! Otherwise, Despicable Me: Minion Mayhem is not bad either. Not as complicated ride as The Simpsons and require to wear 3D glasses, but due to the popularity of the movies, I would expect long queue for the ride! Despicable Me: Minion Mayhem sounds quite plausible, given that the Minions are REALLY popular in this part of the world – plus they are already building a second Minion Mayhem at Universal Studios Hollywood! 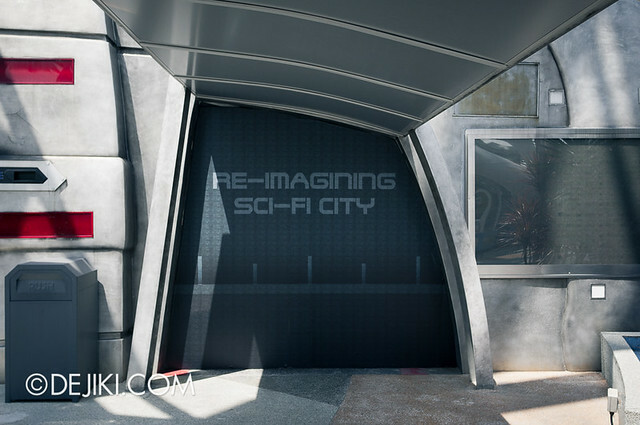 not sure if i hear right but rumours saying they removing sci fi city. i really wan a minions mayhem and mayb a smaller harry potter ride. dont think will be stars wars as star wars are own by disney now. or great if they turn it into for younger audience. like in japan snoopy. The park is lack of thrill rides. And taking away BSG is a disappointment. Hopefully they replace with something equally good or better. They have enough family rides. Even the new area which is expanding is going to have a family ride. USS needs to put in something that is thrilling because without BSG, the thrill seekers have mostly nothing to look forward to. They should also update us as soon as possible so that at least we know what is going to happen. Do u have any like confirm theme of the expansion section of the park? 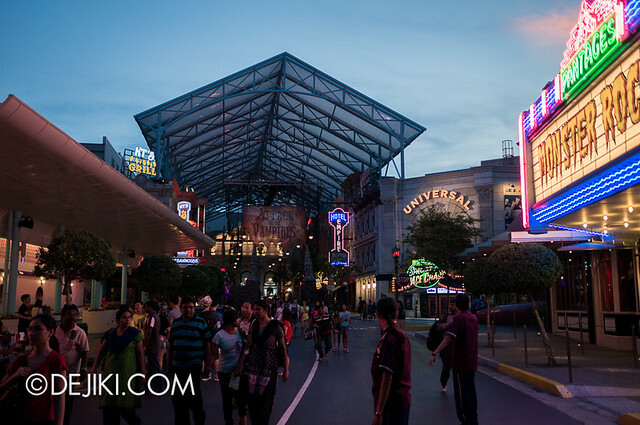 USS having a smaller diagon alley compared to USO would be possible right haha? They definitely need a coaster. I know thrill isnt exactly the biggest draw in this part of the world but closing BSG would seriously limit the park’s appeal to a certain demography of people. Would really hope for an expansion or a 2nd park but it very unlikely to happen. I strongly disagree if some people think BSG should be replaced with another family-themed or virtual ride. 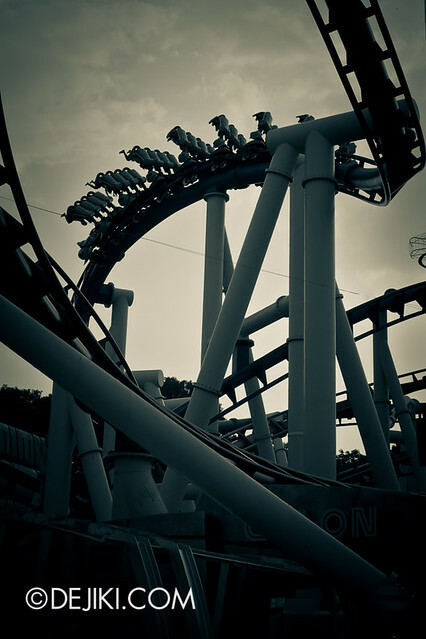 In every major theme park in the world there’s always a flagship roller coaster ride. Universal is a major brand, having a large coaster is not just a necessity, but a must in order for it to live up to its reputation and draw a diverse profile of visitors. BSG is featured on Themeparkreview, a prominent coaster blog, and mentioned in various other blogs. While not as intense as many others, it is nonetheless unique for it’s launched lift, a duelling concept with two different coasters, and a really compact track layout that looks exciting. I know of many who will not be visiting USS any more without this ride, unless it’s replaced with another great coaster from B&M or perhaps an Intamin megalite. Let’s face it, for true ride enthusiasts, it’s incomplete without a coaster that delivers high thrills. USS was complete when it had Transformers, Mummy and BSG headlining the thrills, all three being very different in experience and adrenaline. Without BSG, it is a tremendous loss for the Universal brand. I really hope it’s just rumours. And I hope the management understands the expectations the Universal brand brings. If BSG is really shut for good that will be a great loss for USS. I for one will not be stepping into USS anymore until BSG or a replacement roller coaster is up. There are simply not enough rides at USS to appeal to thrillseekers. While USS is arguably targeted at families, to exclude the younger and more adventurous demographic would be a mistake. A bona fide theme park MUST have a signature roller coaster ride. Completely agree. 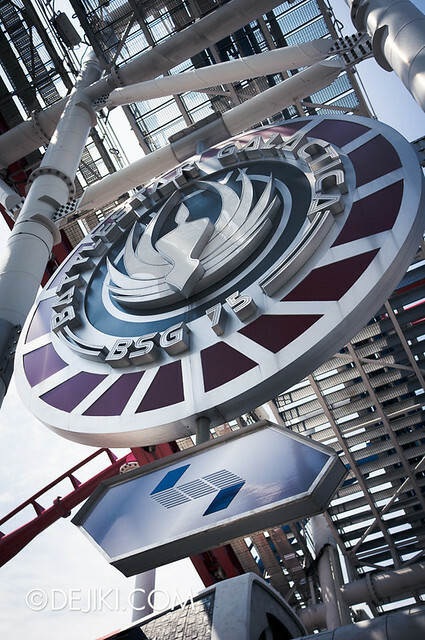 BSG was the reason i brought my oversea friends to USS, without it its a theme park for children and not for me. How about a B&M flying coaster (something like the flying coaster in genting), or/and maybe a Maurer sohne skyloop roller coaster (something like buzzsaw at dreamworld in gold coast)? They both seem to be very thrilling rides and they could be themed to sci-fi city. I would love to see Universal studios Japan’s space fantasy the ride or a maurer sohne skyloop coaster in place of battlestar galactica/as a new attraction.